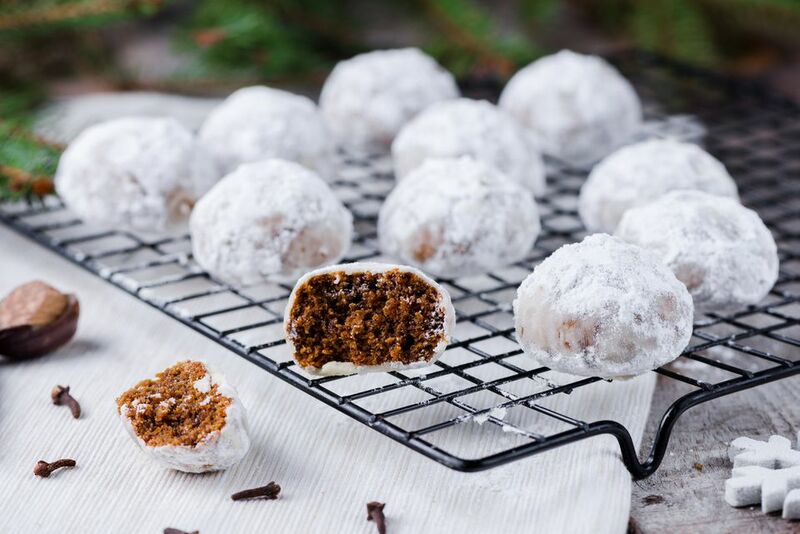 Pfeffernusse cookies are a spicy, fragrant cookie perfect for Christmas. The essential ingredient is, surprisingly, the black pepper, which combines with the rest of the spices and the molasses for a truly unique taste. It may look like a lot of spices when you're baking these up, but the combination is, we promise, perfect. And, since they are vegan, you can feel extra good about treating yourself and the environment well for the holidays when you make your vegan Christmas cookies. This version of pfeffernusse cookies is made with no eggs and dairy, but with vegan margarine and an egg replacer making it dairy-free and egg-free. Preheat the oven to 350 F. Lightly grease two baking sheets. Combine the flour with the baking soda, cinnamon, cloves, nutmeg, allspice, and pepper. Set aside. Using an electric mixer, beat together the vegan margarine, brown sugar, and molasses until well combined and as light and fluffy as you can get it. Add in the prepared egg replacer and vanilla, again beating until well combined and as fluffy as possible. Gradually beat in the dry ingredients, mixing until well combined. The dough should be a bit more dry and crumbly. Roll the cookie dough into 1-inch balls and place them on prepared cookie sheets. Do not flatten. If the dough is too crumbly, you can moisten your hands a bit when rolling the dough to get it to stick together. Bake the cookies for 13 to 15 minutes, until just starting to crack; do not over-bake. Allow the cookies to cool, then gently roll in powdered sugar until completely coated. You can also place the sugar in a bag or a bowl and gently roll the cookies around.